Brother of Origin, Kronos intrigues and impresses by its blackness. 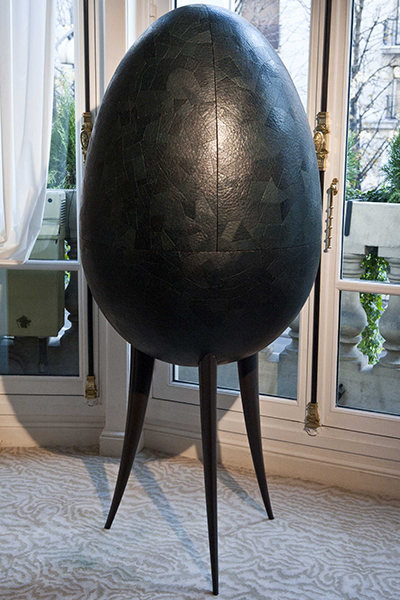 This outsized egg, on its three bronze feet, owes its obscurity to emu eggs which cover it with a dark skin. Reptilian, unusual and slightly disturbing…. We dare to get closer and, gently, to open it.. Inside, no evil animal. It has disappeared. 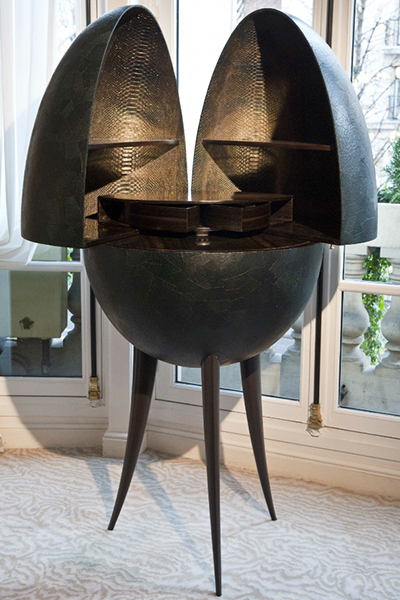 But its evocation remains, inspired by the python skin lining its interior. The ebony covering the secret of the cavity further accentuates this black depth and it is with some apprehension that we swivel open the two central parts in order to gain access to its mystery. A strange and precious sculpture, it is also full of symbolism. But, unlike Origin who represents fecundity, Kronos is the god with deceitful thoughts and a twisted mind if we are to believe Homer and Hesiod.